A common question that we get asked by our customers is how long it generally takes for a full glass replacement service? The answer will typically vary based on which window in the automobile requires replacement and the amount of preparation time that our team will need to accomplish before we can start installing the glass. The last thing our team wants to do is rush a critical job such as replacing the glass on your vehicle when this can result in failure or minor annoyances later. Many consumers do not realize that if a side window is broken; for example, that our technicians will typically need to remove the door to the vehicle to properly remove the damaged glass, clean up any glass shards or remnants, and then prepare the door for new glass installation. This process takes some time, and it can range between two and four hours for our highly skilled mobile repair teams to finish the job. Our staff knows what they are doing; however, and when you call our team for a service inquiring, we will provide our best estimate to you on how long the work will take to accomplish. Our clients then take this information to plan out the best date, time, and location to arrange our mobile glass replacement service that is convenient with their busy schedule. We typically dispatch our teams to work on customer's automobiles at their homes, places of work, and even local parking lots depending on the type of job and length of time the client plans on being at the given location. Just about anything is possible when you make the decision to partner with Downey Mobile Auto Glass. 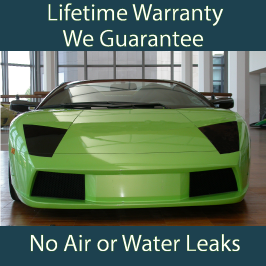 You will also never have to worry about our mobile repair teams being licensed or insured to work on your automobile. We like to eliminate any worries that customers may have regarding liability when it comes to auto repair, and we have the customer service reputation to prove it. If you find yourself in need of a full glass replacement service, please give us a call today. We will always be happy to talk shop with you, and discuss the process and procedures that we use to replace the glass in your automobile. Please give us a call today, and our team will always provide you with a free estimate on our work.